This attractive variety originates in Laos. Glowing, creamy-white fruit have a hint of yellow, and are ribbed, flattened and of medium size. 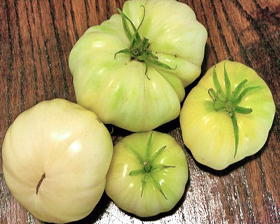 Sweet, low acid flavor will make this "ghostly" tomato a favorite of those looking for a mild variety. Sow tomato seeds 6mm deep in pots or trays of good, free draining, damp seed compost and cover with a sprinkling of vermiculite or compost. Place in a propagator, or seal container in a polythene bag, at 18 - 21C until after germination, which takes 7 - 10 days. These seeds have been grown in eco-clean environment. We use only manual manufacturing and care with love about each seed to provide the highest quality, good genetics, disease-free organic seeds.